Editor's Note: This content was sent out to our email recipients as recent eBlast information and we wanted to share it with our website visitors also. Enjoy. Accuracy Takes Time. When we look back in time, it's hard to imagine the patience that was necessary to develop an accurate thermometer. According to an article in Popular Science in September 1891, it took two years for glass to complete a slow contraction period. 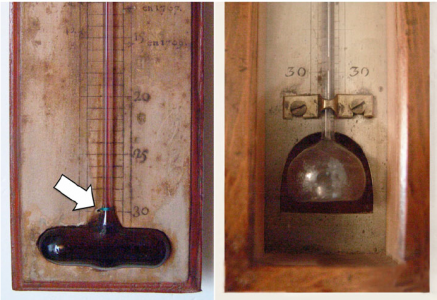 In order for a glass thermometer to be accurate, the glass tubes were "seasoned" that entire time! It was only after this seasoning time that the most accurate thermometers were calibrated. We've come a long way in 128 years, from those antiquated, mercury-based thermometers to TEGAM's electronic, digital thermometers and calibrators - like our new 940A and 945A industrial thermocouple calibrators. We've listened to our customers and built some exciting new features into both the 940A and 945A thermocouple calibrators. What can you expect from these handheld, field-use instruments? Rugged: We designed the 940 Series thermocouple calibrators to meet MIL STD drop shock and vibration standards – without a rubber boot. Designed to work for the REAL world: . Overall, the 940 has one of the broadest operating ranges for a portable calibrator -20 to 55°C (-4 to 131°F). This range will go from a walk in freezer to up-close and personal with a heat treating oven. See the Specs for this new thermocouple calibrator right here. Accuracy Matters: Our published accuracy specifications are the total uncertainty at 2-sigma. We also include the internal cold junction compensation. You do not have to haul around a $5000 ice point reference to meet specifications. Reliability: The 940 Series last 500 working hours on just 3 AA batteries, that's 10x comparable models. Value: The 940 series instruments come standard with full calibration reports; no expensive options necessary to get your numbers! Calibration Warranty: 2 Year Cal warranty PLUS subscriptions are available to access TEGAM's ISO 17025 accredited cal lab. Do you have more questions for us about these fine, new temp. measurement devices? You can contact us here and we'll gladly get back to your shortly. See all our temperature measurement solutions here by TEGAM. Thanks for visiting.